Sea World Inflatable For Kids. Imagine having your own sea world right on your lawn or garden. With our Sea World bouncy castle, you’ll get hours of joy and play without having to leave your property. 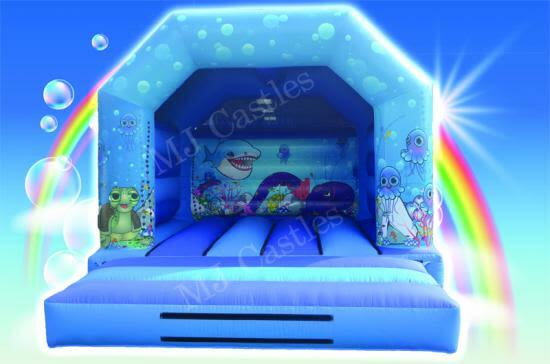 Your kids will love playing with friends inside a bouncy castle decorated with images of fish and other sea creatures. Let their imaginations soar as they enjoy their one-of-a-kind party. Make all of this possible by hiring your own Sea World kids’ bouncy castle! For the small price of £50, your kids can jump up on their under-the-sea dream castle for an entire day. And if you’re thinking of extending the fun overnight, you just have to add £15! Don’t worry about installation - just show us where to set it up and we’ll handle everything for you (space required is 18 ft x 15 ft), from beginning to end. We carry all equipment and materials necessary, including a rain cover in case the heavens begin to pour. We’ll also collect the equipment after the party, so you won’t have any hassles to take care of. Introduce your little ones to the friendly octopus, shark, jellyfish, and turtle in this coral reef kingdom. Call or email us for bookings, or simply fill out our contact form today.